Thanks to all those who provided feedback on +v5, and on the +6 beta. Special thanks to Dermotron for helping me out with the national teams' competition histories too. This is a patch which combines the most recent release from the Update team with the latest discoveries from the Patches forum. It incorporates the October 2018 update, Tapani's 2.22 patch, the latest renaming patch, and other smaller things from the Patches forum like the restructuring of certain leagues. In short, it's a patch that is designed to make the game as realistic as possible for 2018. *International friendlies calendar rewritten and synced for all confederations: friendlies are now played on the same designated dates. *Portuguese ProLiga restructured back to 18 teams (Taça de Portugal also accordingly edited). *Republic Of Ireland season now takes place over a single calendar year, eg only 2018, then only 2019 etc. *Russian season now takes place over two calendar years, eg 2018/19, then 2019/2020 etc. *Russian Football National League restructured to 20 teams. *Champions League Final now played on a Saturday. *Confederations Cup code edited to ensure it takes place in 2021/2025 etc, host also changed from Russia to Qatar. *Copa Libertadores knockout rounds now use away goals as a tiebreaker before penalties (except for the final, which now goes to extra-time before penalties). *EFL Cup matches now go straight to penalties if scores are level after 90 minutes (except for the Final, where extra-time is still played). *French fixtures rescheduled in Ligue 1 & 2, in the former you should no longer have to play two matches on the same day. *German DFB-Pokal no longer limited to 3 non-EU players (now no limit). *Greek Cup's Semi Finals will no longer clash with European fixtures (the Final will also now be played on a Saturday). *Irish Munster Senior Cup now searches for the Munster clubs' updated database names. *Italian Serie A & B no longer use playoffs to determine the positions of teams who finish with equal points: they now use head-to-head results folllowed by goal difference (thanks gio!). *Japanese Emperor's Cup now takes place throughout the year, rather than just December (where it clashed with the FIFA Club World Cup). *Japanese J1 League Final second leg brought forward a few days to avoid a clash with the FIFA Club World Cup. *International teams a bit more likely to call up players playing well in their own domestic leagues over reserves at clubs in higher level leagues. 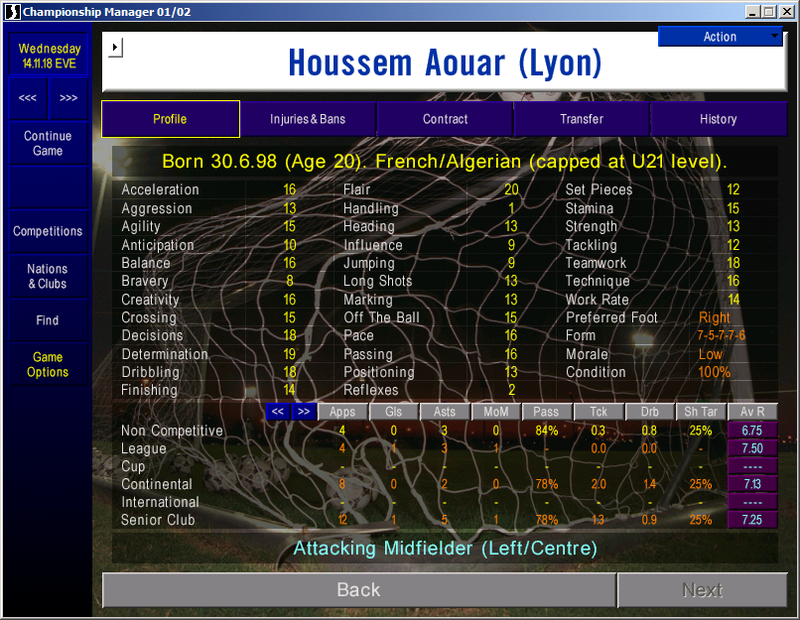 *Regens now return with a higher level of Current Ability (also there should be fewer 20 year old regens). *Under-21 caps are no longer binding: players can potentially play for a different nation in the future. *Argentinian foreign players allowed in matches & squads increased from 4 --> 5. *French clubs can now no longer sign any players between the summer and winter transfer windows. *Girona FC are now properly linked to their B team. *Regens won't be assigned to clubs with 45+ players: previously they could be, potentially resulting in the club free transferring some decent youngsters already in their squad (thanks xeno!). *Russian second nationalities will be gained after 5 years instead of 10. *Turkish competitions' substitutes named increased from 7 --> 9. *Version name updated in Game Settings screen. *Republic Of Ireland's summer break is longer than real life as players stopped training in June. *Under-21 caps: '(capped at U21 level)' will be shown after a player's second nationality regardless of which nation actually capped him. *Australian league restructured to 10 teams. *English National League restructured to 24 teams. *English Northern Premier League Premier Division restructured to 22 teams. *English FA Cup & English FA Trophy team selections adjusted to accomodate the above restructuring. *French leagues restructured to 20/20/18 teams. *Greek leagues restructured to 16/16 teams. *Italian Serie A + B restructured to 20/22 teams. *Polish I Liga restructured to 18 teams. *Puchar Polski format and team selection rewritten to largely match modern version. *Taça de Portugal format and team selection rewritten to largely match modern version. *Argentine Cup replaces the Polish League Cup (thanks gio!). *CONCACAF Gold Cup replaces the old FIFA World Club Cup competition. *FAI Cup format and team selection rewritten to match modern version. *FIFA Club World Cup updated close to its modern format using the now defunct German League Cup [thanks gio!]. *French Coupe de la Ligue rewritten so that all clubs in the three divisions enter. *German DFL-Supercup replaces the Intercontinental Cup (thanks gio!). *International competitions begin in the correct year. *Recopa Sudamericana replaces the Inter-American Cup (thanks gio!). *African Cup of Nations: now played in June instead of February. *Australian A-League: Final renamed to Grand Final. *Australian A-League: Grand Final now played a week after last Closing Stage fixture. *Australian A-League: Opening Stage winners called Premiers instead of Minor Premiers. *Champions League: Final now played on a Saturday. *Copa América: Extra-time removed from Quarter Finals, Semi Finals and Third Place Playoff (penalties if level after 90 minutes). *Copa América: Guest entrants now China and Qatar (instead of Jamaica and Mexico) to avoid potential Gold Cup clashes. *Copa do Brasil: Away goals no longer count in Final (penalties if level after both legs). *Copa Libertadores: Knockout rounds now use away goals as a tiebreaker before penalties (except for the final, which now goes to extra-time before penalties). *Copa Sudamericana: Away goals now count in Quarter Final & Semi Final (away goals & penalties if level after both legs). *Copa Sudamericana: Final no longer potentially goes to a third game decider (extra-time & penalties if level after both legs). *Coppa Italia: Slight correction of tiebreak offsets. *Coppa Italia Lega Pro: All rounds apart from Semi Final & Final now one leg (extra-time & penalties if level after 90 minutes). *Coppa Italia Lega Pro: All rounds' draw dates pushed back one week, apart from Semi Final & Final. *Coupe de Belgique: Final no longer potentially goes to a replay (extra-time & penalties if level after 90 minutes). *EFL Cup: Extra-time removed from all rounds apart from the Final (penalties if level after 90 minutes). *EFL Trophy: Substitutes named increased from 5 --> 7. *EFL Trophy: Extra-time removed from all rounds apart from the Final (penalties if level after 90 minutes). *EFL Trophy: Section Finals now only one leg (penalties if level after 90 minutes). *English FA Cup: Quarter Finals no longer potentially go to a replay (extra-time & penalties if level after 90 minutes). *English FA Trophy: English National League North teams now fill out the competition instead of other lower divisions [thanks xeno!]. *English FA Trophy: Second, Third & Fourth Round no longer potentially go to a second replay (extra-time & penalties if level after replay). *English FA Trophy: Semi Final & Final no longer potentially go to a replay (extra-time & penalties if level after 90 minutes). *English FA Trophy: Away goals no longer count in Semi Final (extra-time & penalties if level after both legs). *English leagues' prize & TV money updated (IRL values when using £x2). *English National League North: Relegation places increased from 2 --> 3. *English National League North: Substitutes named reduced from 7 --> 5. *European continental competitions' prize money updated (IRL values when using £x2). *FAI Cup: Final now played at the national stadium. *FAI Cup: Replays removed from all rounds except Quarter Final & Semi Final. --> Brazilian Campeonato Nordeste fixture #11. --> Brazilian Campeonato Paranaense televised fixtures #11. --> Croatian 1. HNL fixture #19. --> Croatian 2. HNL North & South fixture #19. --> Danish Superliga (for seasons starting in odd years) fixture #22. --> Dutch Eredivisie fixture #13. --> Dutch Eerste Divisie: adjusted date of fixture #13. --> German 3. Liga (South) fixture #22. --> Norwegian 1. Divisjon fixtures #14 & #15. --> Spanish Segunda División (even year) fixture #33. --> Spanish Segunda División (odd year) fixture #38. --> Spanish Lower Division (even year) fixture #33. --> Spanish Lower Division (odd year) fixture #37. --> UEFA Champions League: Phase 2 Fixture 1 & 2 dates changed (games no longer played on a Friday). --> UEFA Europa League: Third Round First Leg game should no longer clash with international matches. *German Bundesliga's prize & TV money updated (IRL values when using £x2). *German 2. Bundesliga's prize & TV money updated (IRL values when using £x2). *German DFB-Pokal: 3 non-EU player limit removed (now no limit). *Hrvatski Cup: Quarter Final & Final now only one leg (extra-time & penalties after 90 minutes). *Irish Cup: Replays removed from all rounds. *Irish Leinster Senior Cup: All league teams now selected (previously overlooked Wexford FC). *Irish Munster Senior Cup: Game now searches for the Munster clubs' updated database names. *Irish Premier Division's prize money updated (IRL values when using £x2). *Italian Serie A's prize & TV money updated (IRL values when using £x2). *Kypello Elladas: Round of 16 now two legs (away goals, extra-time & penalties used). Quarter Final draw date also pushed back one week. *Kypello Elladas: Semi Finals will no longer clash with European fixtures (the Final will also now be played on a Saturday). *League of Ireland Cup: Final now only one leg (extra-time & penalties if level after 90 minutes). *League Of Ireland First Division times teams play each other reduced from 4 --> 3. *NIFL Charity Shield: Match goes to penalties if level after 90 minutes (instead of having no tiebreak at all!). *NIFL Cup: Semi Final now only one leg (extra-time & penalties if level after 90 minutes). *NIFL Cup: Semi Final pushed back a week so it no longer clashes with international matches. *Norwegian Cupen: Replays removed from Fourth Round - Final (extra-time & penalties if level after 90 minutes). --> Belgian First Division [TV]. --> European continental competitions [PM]. --> French Ligue 1 [TV]. --> German 2. Bundesliga [PM+TV]. --> Irish Premier Division [PM]. --> Italian Serie A [PM+TV]. --> Portuguese Primeira Liga [TV]. --> Russian Premier League [TV]. --> Scottish FA Cup [PM]. --> Spanish La Liga [PM+TV]. --> Turkish Süper Lig [TV]. *Puchar Polski: Quarter Final & Semi Final now two legs (away goals, extra-time & penalties if level after both legs). *Puchar Polski: Final now played at the national stadium. *Puchar Polski: Final moved forward a couple of weeks to beginning of May. *Scottish Cup: Semi Final no longer potentially goes to a replay (extra-time & penalties if level after 90 minutes). *Scottish Cup: Semi Finals now played at national stadium (though not over the same weekend). *Spanish La Liga's prize & TV money updated (IRL values when using £x2). *Supertaça Cândido de Oliveira: Match no longer shows as potentially going to a replay (as extra-time & penalties will always occur instead). *Svenska Cupen: Final now only one leg (extra-time & penalties if level after 90 minutes). *Taça de Portugal: Replays removed from all rounds. *Taça de Portugal: Semi Final now two legs (away goals, extra-time & penalties if level after both legs). *Türkiye Kupasi: Quarter Final & Semi Final now two legs (away goals, extra-time & penalties if level after both legs). *Türkiye Kupasi: Semi Final & Final draw dates pushed back a week. *USA MLS: League games no longer enter extra-time after a draw (this used to occur from the second season onwards - thanks Fiestita!). *Welsh League Cup: Semi Final now one leg (extra-time & penalties if level after 90 minutes). *AI clubs in background leagues will now hire managers. *Bosman signings now allowed in Croatia and Poland, removed from Israel and Ukraine. *Continental competitions load regardless of the leagues selected [thanks to gio for making this work for European continental competitions too]. *Golden goal offsets tweaked, it should prevent things like all clubs from the top division being drawn against each other. *Human managers can apply for jobs at clubs in inactive leagues, causing that club to hire a manager (may be a human manager or an AI manager). *Inflation: Values increased across the game (regardless of currency selected), particularly towards the higher levels. *Jobs abroad: increased again the likelihood that managers will get jobs abroad. *Loans: increased the likelihood of more loan deals being made in the game (mostly at lower levels). *Manage any team, regardless of whether their league has been selected. *Players on loan can now not be bought by AI/human managers. *Players outside European leagues can gain second nationalities as long as they aren't European. For example, Uruguayans playing in Argentina can become Uruguayan/Argentine but Spanish players playing in Argentina won't become Spanish/Argentine. *Regens from smaller nations will now regenerate at younger (normal) ages. *Regens won't be promoted at AI clubs with 45+ players, in an attempt to keep the transfer market fluid when playing with a max database. There should be fewer AI clubs with 50 player squads, most of which are average regens (thanks xeno!). *Reserve teams enabled for German, Portuguese and Spanish clubs without a B team. *Scout roles can be offered to staff (except physios). *Transfer windows added to all leagues. *AI teams can now register on-loan players for Europe. *Argentina: Copa Argentina history added. *Argentina: Foreign players allowed in matches & squads changed to five players. *Argentina: TV and prize money added to Primera B División, reduced in Primera División. *Australia: 4 --> 5 foreign players allowed in match day squad. *Awards: Continental awards will no longer be handed out straight away in the summer of 2017 [thanks xeno!]. *B teams removed from all international teams. *Confederations Cup: last World Cup winners enter instead of last Confederation Cup winners (thanks gio!). *England: League Two relegation places reduced from 3 --> 2. *England: Players aged 24+ can now be loaned for a full season (instead of a maximum of four months). *England: Simultaneous loans allowed increased to 9. *England: Suspensions will display immediately after a match rather than after one day. *England: Tottenham Hotspur will move to a new stadium in 2018. *England: Wembley is always used for relevant English cup finals and England international games. *European competitions: raised from 19 --> 21 the age for which players don't need to be registered for Europe. *Germany: 18 non-EU --> no restrictions in match day squad (removes FGN symbol from squad screen). *Germany: B teams added for FC Augsburg & TSG 1899 Hoffenheim (replacing the B teams of C.D. Badajoz & Real Unión de Irún). *Host nations for various competitions updated. *Netherlands: Eerste Divisie relegation place removed (as it doesn't work). *Obscene gesture suspensions will now take effect immediately instead of after 14 days. *Poland: 18 --> 3 non-EU players allowed in match day squad. *Portugal: B team added for Vitória Sport Club (replacing the B team of Tennis Borussia Berlin). *Republic Of Ireland: Loans allowed per season increased to 9. *Republic Of Ireland: Loans can be made between clubs in the same division. *Republic of Ireland: Simultaneous loans allowed increased from 5 --> 9. *Republic Of Ireland: Suspensions begin immediately instead of after 14 days. *Russia: New game begins 10 days earlier (to give players a chance to make transfers). *Russia: Second nationalities will be gained after 5 years instead of 10. *Russia: Squad restriction of 10 foreign players added. *Scotland: Players aged 22+ can now be loaned for a full season instead of only four months. *South Korea: League start date pushed back to May (due to empty calendar). *Spain: B teams added for Almería, Getafe, Girona, Granada & Villarreal (replacing the B teams of Extremadura, Salamanca, SSV Ulm, Stuttgart Kickers & SG Hoechst). *Spain: Non-EU players allowed in La Liga match day squad increased from 2 --> 3. *Spain: Real Sociedad can now sign Spanish players who don't have a Basque second nationality (thanks JohnLocke!). *Spain: S.D. Éibar can now sign non-Basque players. *Turkey: Foreign player limits updated for all three divisions (squad/match numbers per division is: 14/11, 10/5, 0/0). *USA: Canadians no longer count as foreign players. *Competition histories in correct years. *English loan limit: the game now displays the correct number of loans allowed at one time (nine) once you have reached the limit. *English Northern Premier League Premier Division renamed to English National League North. *English National League North awards now reference that division instead of Wales. *English National League North suspensions are shown to be for English matches instead of Welsh matches. *Human manager's star players shown. *Inflated € option added: select the Eurox2 currency in Game Settings to roughly double the values of everything in the game (symbol also changed from ¤ to E). *Inflated £ option added: select the £x2 currency in Game Settings to roughly double the values of everything in the game. *MLS clubs now named correctly. *Obscene gesture suspensions described as 'Misconduct' rather than 'Use of an illegal substance'. *Portugal and Spain's optional leagues now named correctly in 'Select Leagues' screen. *Round names updated for various competitions (including three new names: Round of 64/32/16). *Squad numbers can now be issued in all leagues. *Toronto FC's nation is now shown as Canada instead of the USA (this is only cosmetic: Toronto's regens will still be American). *Version info updated in Game Settings screen. *Applying for jobs at tiny clubs/nations will give you an error message (manager_manager..cpp 12456). The error is harmless, although no manager will be appointed by that club/nation. *Australian clubs are selected at random for Asian continental competitions. *Euro 2020: hosting is a bit messed up: whoever hosts Euro 2024 will be shown as hosting Euro 2020 when teams qualify for it in news items (or it will show as Afghanistan if the 2024 host hasn't yet been decided). Seeing as Euro 2020 doesn't really have a host IRL (I suppose Engand at a push) I'm not too bothered about it. *Northern Ireland: Transfer window messages are shown twice, due to Denmark also using Northern Ireland's code. *Norway: Transfer window messages are shown twice, due to Sweden also using Norway's code. *On-loan players registered by their loan clubs for Europe will take one of their parent club's 25-man quota. *Scottish First Division playoffs are not the real life version, they are just what was laying dormant in the exe. *Squad numbers in the Swedish Division 1 can't be assigned in the first season. - Belgium: Transfer Deadline Lifted message in second window (January 1st). - Denmark: Any deadline lifted/approaching/reached news items at all. - Germany: Transfer Deadline Lifted message in second window (January 1st). - Norway: Transfer Deadline Lifted message in either window. - Sweden: Any deadline lifted/approaching/reached news items at all. You will need a new Data folder and a new cm0102.exe file to play. Please read the rest of this post fully. The following Data folder must be used: +v6 Data. The data here is 99% based on the update team's October 2018 release, so full credit to them. In order for the data to be compatible with the new cm0102.exe, some alterations had to be made, which means that the above Data folder is essential. No other Data folder will be compatible with this patch, only the one linked above. Delete the Data folder in your Championship Manager folder and extract/unzip the new Data folder from +v6 Data.zip. Copy and paste that Data folder into your Championship Manager folder. Now you just need a new cm0102.exe. Your game needs to have been updated to version 3.9.68. You can check what version you're currently using by starting a game and looking to the top left hand corner. If it doesn't say 3.9.68 (or 3.9.68T), you'll need to update your game. Download the official 3.9.68 patch from here and run it. The vast majority of updates and patches are built for 3.9.68 so updating to this version is essential. Next, a little background for people new to this forum. The new cm0102.exe you'll be playing with will be 95% based on the last patch released by a coding guru from these parts named Tapani, patch 2.22. Game start year: Allows users to set the season the game will begin in. For this patch this option is locked to 2018. Game speed: The speed at which the game displays things to you, most notably the match day commentary and how quickly the game continues when you're holidaying. Set it to x200 and the game will fly by. Note that this is not the same as increasing the game's processing (loading) speed. Users can choose speeds of x0.5, default, x2, x4, x6, x8, x20 or x200. Idle sensitivity: This prevents the game from using your computer's full processing power when it doesn't need to. For example if you're just looking at a player in your squad screen, the game isn't processing much information and so doesn't need to use a lot of power. Previously the game would just use full power regardless, but with this enabled it will prevent that. This in turn will stop your computer from overheating, causing unneccessary wear and tear to your device. Users can choose options for both desktop or laptop computers. Window: This changes the resolution at which cm0102 is displayed, with widescreen modes now being an option. Users can choose from resolutions of 720x480, 800x600 (default), 1024x600, 1024x768, 1280x720, 1280x800, 1280x960, 1280x1024, 1366x768 or 1400x900. If you're not sure which to pick, just stick with the default 800x600. Disable unprotected contracts: This will prevent contracts from becoming unprotected. A feature which looked like it could be a prominent thing IRL in 2002 when the game was released, but very rarely occurs today. People can choose to undo this feature if desired, but if they enjoy it and are used to it in-game then they can request for it to not be disabled. Coloured attributes: Players attributes are coloured on a sliding scale of red (20) to grey (1) scale. An example can be seen here. Hide non-public bids: A human manager will always be alerted to AI bids for players on their shortlist, regardless of whether an AI team makes that bid public or not. With this turned on, AI clubs can now quietly sign players who are on your shortlist without you receiving any alerts about their bids in your News feed. 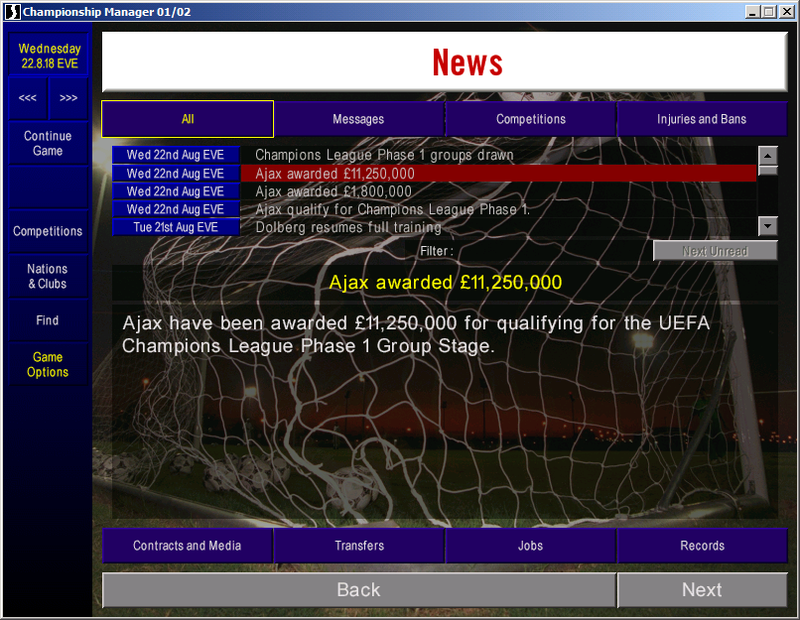 Development / benchmark mode: Allowed users to run several instances of cm0102 to test tactics. This feature is broken in 2.22 so it is locked to No for this patch. Most users will be surprised to learn of the existence of Tapani's 2.22 patch (or to give it its full title: 2.22-wip0): it's his 2.21.1 patch with a small (3-5%) processing speed optimization. It was posted in the Programming forum some time ago. Been manic about cm patching lately and especially the speed optimizations this weekend -- and I got the speed up about 3-5%. The larger the database the bigger percentage. But still not enough to be noticed. If someone else wants to try optimize CM I think I have found a CPU hotspot: the function at 840d80 is called thousands (up to 300,000) times each CM day. Each call is about 40,000 clock cycles. This is the first spot where I would continue the optimization. I have no idea what the function does. It takes arguments of a person and club and four other arguments. A patcher with the speed optimization (untested mostly) is here. I'm a bit uneasy about making public something he had posted privately. But, given the calibre of his previous work I felt it was better to make use of it rather than let it sit idle. Unfortunately, Tapani's 2.22 will not be compatible with the new data folder we'll be using above. Therefore, people are going to have to request an exe via the form below if they want to play with their preferred Tapani options. I will then create the exe with Tapani 2.22 and modify it so it will be compatible with the new data. The exes will be created by using a program called Flex, released by a user named JohnLocke a few years ago. Without his work the creation of multiple exes like this would be impossible, so big credit to him. His tools make creating patches so much easier for everyone. Requests will probably be met with dwindling enthusiasm so be sure to get yours in early. Again, make sure that your desired exe hasn't already been requested by checking post #2. If you are comfortable with using Flex, then you can create an exe yourself by jumping to the Flex users part below. If you're unfamiliar with Flex then simply ignore the previous line and proceed to the exe request form directly below. Once the new cm0102.exe you desire is available, download and extract/unzip it. Delete the cm0102.exe in your Championship Manager folder and copy and paste the new cm0102.exe into your Championship Manager folder. If you have the new Data folder (and the city.dat file from the latest update) then you are ready to play. Nothing more needs to be downloaded: to reiterate, the Tapani patch, renaming patch and latest updates are all already incorporated into the Data folder and exes in this thread. 1. Delete your Data folder, download the +v6 Data folder and move it into your Championship Manager folder. Download the October 2018 update and copy and paste the city.dat file from that into the new Data folder. 2. Download Rename v1.4.5 and move the exe from that into your CM0102 folder (after extracting it). Do not use the other files. 3. Apply Tapani 2.22, using whatever options you desire (the start year must be 2018 and don't tick development / benchmark mode). 4. Using Flex, apply the 2.22 Reversal patch. 5a.New values exes: Reopen Flex and apply the v6.patch (new values). Do not apply this while doing the previous step, do it separately. 5b.Old values exes: Reopen Flex and apply the v6.patch (old values). Do not apply this while doing the previous step, do it separately. Here are the .patches used in making +v6: .patches collection. These are only here to satisfy other patchers' curiosity and for those that want to try applying them to different exes or databases. No need to download for the vast majority of users. 3. Download the October 2018 update and extract the city.dat file only. Copy and paste it into your new Data folder. It is advised that you run the cm0102.exe that you download in compatibility mode for Windows XP (Service Pack 3). To do this, right click on the cm0102.exe that you've downloaded and select Properties. 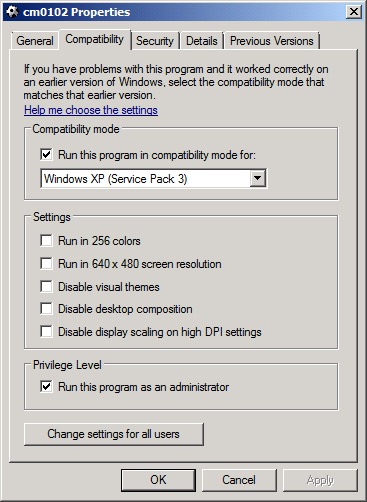 Go to the Compatibility tab and choose Windows XP (Service Pack 3). Also make sure that you're running the game as an administrator. Your properties tab should look like this. Windows Vista users, please read the first item in the FAQs. I've added a bug list/FAQs to post #3. If you have any issues with the patch, please read that post first as it is likely your issue will have already been addressed. Last edited by saturn; 07-11-18 at 09:47 AM. It is advised that you run the cm0102.exe that you download in compatibility mode for Windows XP (Service Pack 3). To do this, right click on the cm0102.exe that you've downloaded and select Properties. Go to the Compatibility tab and choose Windows XP (Service Pack 3). Also make sure that you're running the game as an administrator. Your properties tab should look like this. The exes will be first split in two: those with the New values and those without. After that they will be split by Game Speed. They will then finally be ordered by Window size (smallest first), then Idle Sensitivity (desktop, laptop, off), and then the other options. All further exes will go in this post. Don't forget that you need the new Data files from post #1 as well as a new exe. Last edited by saturn; 12-11-18 at 08:14 AM. Here is where all known bugs, errors and common FAQs are listed. If after trying everything in this post and you can still not create a game, try using this version and let me know whether it works. Include what version of Windows you are using in your post. Pre-game issues: Errors that prevent you from starting a new game. Windows Vista users: For now the patch only seems to work when loaded in Olly. See instructions here. You can ignore the last part (unless it does still crash - in which case let me know what the address in Olly is). v3.9.68 index..cpp 5809 error(s): There is a mismatch between the Data folder and cm0102.exe used. Solution: Download an exe from post#2. v3.9.68T Setup..cpp 1672 error: You are missing the city.dat file in your Data folder. Solution: Download the October 2018 update and copy and paste the city.dat file from there into your Data folder. Game freezes during 'Initialising game data': You have the wrong euro.cfg file in your Data folder. Solution: Delete the euro.cfg file that's currently in your Data folder, and copy and paste the euro.cfg file from the Data folder in post#1. Unable to find the GERMAN_FIRST_DIVISION index (and many other indexes): There is a mismatch between the Data folder and cm0102.exe used. Solution: Download the Data folder from post#1. Hard crashes: These are bugs that will cause your game to crash, and upon reloading your game will crash again in the same manner (usually on the same date). These bugs are terminal to a save game, though modifications to your exe may still be able to save them. A bug that has been present since 3.9.60, this is caused by the Average Points table in the Argentine Primera B Nacional being coded incorrectly. In fact, most of the Argentine Primera B is coded wrong, with teams from Group 1 much more likely to reach the playoffs at the end of the season. The crash will occur on August 1st as that is the date the game will try and reset the Argentine league tables for the new season. Not selecting the Argentine league will result in this bug not occurring. Save games may be salvageable by using a modified exe. Slightly different from the other bugs in this category in that it will only occur when creating a new game. This is caused by clicking the 'Select All' button in the 'Select League(s)' screen, and then deselecting England. This results in the game trying to load the English National League North without the English league itself being selected, hence the crash. The game will crash when the season updates in July, usually during the second of the two summer updates. The cause is unknown but the solution is to change the compatibility mode of the cm0102.exe (right click on the cm0102.exe file and click on the Compatibility tab and select one of the options). This seems to occur a lot for Windows 10 users: setting the compatibility mode to Windows XP (Service Pack 3) seems to fix the issue, but different compatibility modes work for others. Seems to be quite a rare crash, caused by something introduced in +v4 (currently trying to track down what that something is). Given that it's to do with transfers, the bug can probably occur regardless of the league(s) selected. Save games may be salvageable by using a modified exe. Soft crashes: These are bugs that will cause your game to crash, but upon reloading your game will continue past the date of the previous crash without issue. These bugs are not terminal to a save game, and the effect of them can be reduced by saving often. A crash that occurs without any error popping up. Quite rare, it is probably caused by the OFC Champions League and only seems to occur in January. It might also be connected to the discipline..cpp 1149 error below. Errors: These are errors that pop up in your game that you can just click past without any crash occuring. There won't be any immediate negative effect on your save, but obviously it's preferable that they don't occur at all. Unknown cause. Might be connected to the ruling_body soft crash above. Caused by an AI team not being able to name a full eleven players for a game (even including grey players). This usually only occurs in the first season, when teams have lots of players loaned out and then suffer several injuries to their remaining players. It can also occur if an international fixture clashes with a European continental competition fixture. This can potentially become a hard crash if an AI team (or a holidaying human team) can't name any players at all for a match. The 612 part of the error indicates it's a home team that is unable to select a full eleven, the 652 an away team. FAQs/Other: Commonly asked questions and other minor issues. I have ran into issues with the editor while making this patch whereby it will not load after changes have been made. After saving any changes you have made in the editor, I would suggest you immediately try and reopen the editor to make sure that no errors have occured. Any further editing of the database will be at your own risk really. This patch has not been made with a No CD cracked exe (and due to the rules of the forum none will ever be created by me). That means you will have to either burn or mount an image of the cm0102.iso. These are not the same as the real life playoffs. 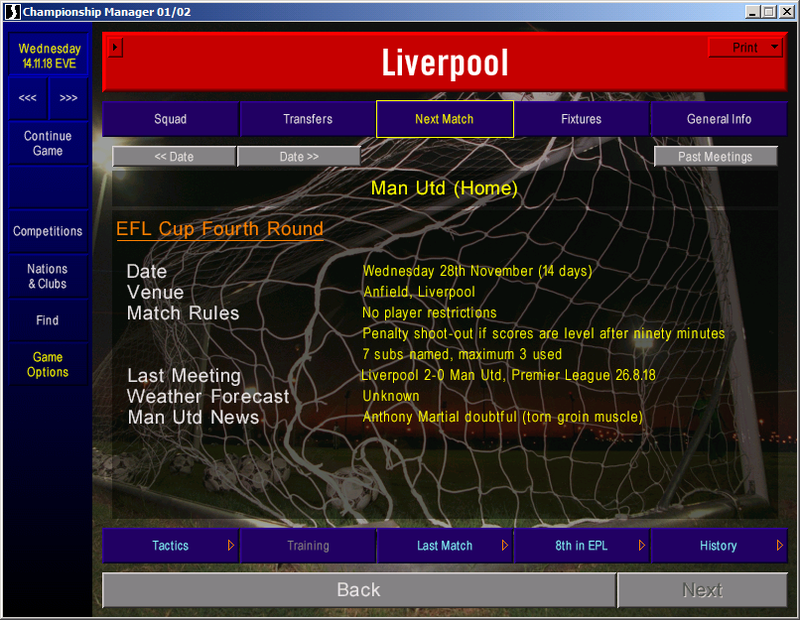 Instead, this is the version of playoffs that were scheduled for the 1999/2000 season and which lay dormant in the exe. They were re-enabled, as having some version of the playoffs was more realistic than having no playoffs at all. Make sure you are using one of the 'New values exes' from post#2 and select the £x2 (or Eurox2) option from Game Settings --> Currency. An ugly looking checklist that shows how the database files needed to be compatible with a +v6 exe were made. Creating the new exe and .patches also included at the end. a. Compare the latest club_comp, nation_comp, and staff_comp.dat files with the ones from the previous data update release (not the previous renaming release) using Patch Creator in Flex 2 (change the Files of Type from Executable Files to All Files). b. Any created out.patch files will show you where changes have been made to the .dat files between the two versions. There will usually be very few (if any) changes made to the files. c. Make any necessary changes to the three .dat files from the previous Renaming patch. x. Alternatively you can just use the .dat files from the latest renaming patch. Any changes made by the update team regarding competitions' reputations or colours in the latest update(s) will however be lost. Add 2 clubs to the English National League, remove 1 club from the English National League North. Add 2 clubs to the French Ligue 1. Add 2 clubs to the Greek Superleague. Add 2 clubs to the Italian Serie A & to the Italian Serie B. Make sure the last positions of clubs are filled in properly or else the Italian Cup could have duplicate teams entered into it, which may cause it to stop running. Remove 2 clubs from the League Of Ireland Premier Division & from the League Of Ireland First Division. Remove 2 clubs from the Polish I Liga. Add 2 clubs to the Russian Football National League. 01. Open v6.patch (new values) from above. Last edited by saturn; 02-11-18 at 09:59 PM. No better man for the first exe, I assumed you wanted the new values? you could add load all player , please? Last edited by 1985giovanni; 02-11-18 at 10:57 PM. No, sorry. That isn't an option for these files, so you'll have to add it yourself in Olly. Here is where all known bugs, errors and common FAQs are listed. [*]Game freezes during 'Initialising game data': You have the wrong euro.cfg file in your Data folder. The game does not start, when it is initializing the data crashes. I checked again that the euro.cfg is the one that comes in +v6 but the problem keeps coming up. Does it actually crash or does it just freeze/not progress at the Initialising game data stage? Try deleting the euro.cfg file from the Data folder and start a new game, just to fully rule it out. If it still crashes try changing the compatibility mode of cm0102.exe to Windows XP (Service Pack 3). Saturn - quick question, I just been testing the exe you got for Ray, have started a game fine, using compatibility WinXP, however, to host a network game, it must be Win95 or NT 4.0, neither work, and the game crashes when just entering the shortlists starting up screen - any ideas?